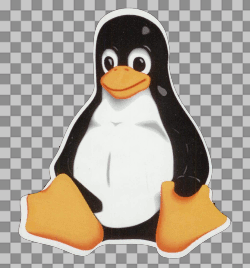 We would like to introduce you the "famous Tux" sticker, the symbol of the GNU/Linux operating system. We guarantee that Free software was used throughout the sticker's conception and sale in order to insure the symbol's purity. The Tux sticker is made out of vinyl so that you can proudly show your love of Linux on many key places such as your car, exterior windows, portable computer, or even your bathroom. Like Linux, Tux is extremely tough and will stand the test of time, providing you with many years of enjoyment. Please read our satisfied customer testimonies. All sales profits will be granted to charities and foundations. You will find the exchange rates here. To make the transaction, you need a PayPal account or you can send a postal money order. Credit cards can be used to register and transact in PayPal. For postal money order, please contact us and we will determine what is the price in your local currency and we will give you the address to send it. Once you have a PayPal account and have placed your order on this page, an email will be sent to you for confirmation. A second and final email will be sent to you upon the shipment of the sticker(s). After which, your email address will never be used again (please read our confidentiality policy).